IMAGE: Felipe Wu of Brazil shows his silver medal. Photograph: Edgard Garrido/Reuters. To begin with, the opening ceremony drew praise from all quarters. Then there were parties all over Rio de Janeiro and finally, the hosts nation Brazil's first medalist. A sweet start to the Olympics prompted the return of a familiar chant from the 2014 World Cup that had been pushed into the darkness by years of bad news. "I am Brazilian, with a lot of pride, with a lot of love," they celebrated. With the Olympics in full swing, beleaguered Brazil is smiling again. "We are not stupid, we know the economy crisis doesn't end with Olympic Games," 46-year-old volunteer Marcos Silveira said at a bar hours after an opening ceremony steeped in local culture and history. "But I just want a break, to feel proud of what we can do, too. Let me enjoy these Olympics that we built to be great for all. We can do great things here, too," said Silveira, an unemployed engineer. On Saturday, some of the proud locals watched as Brazil's women's handball team beat Olympic champion Norway. 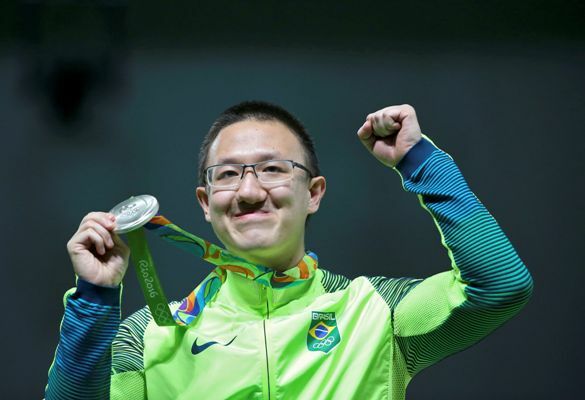 They went on to cheer Felipe Wu to the country's first medal in shooting in 96 years -- a silver in the 10-meter air pistol. A sequence of beach volleyball and volleyball victories made it up for disappointing losses in judo and women's basketball.